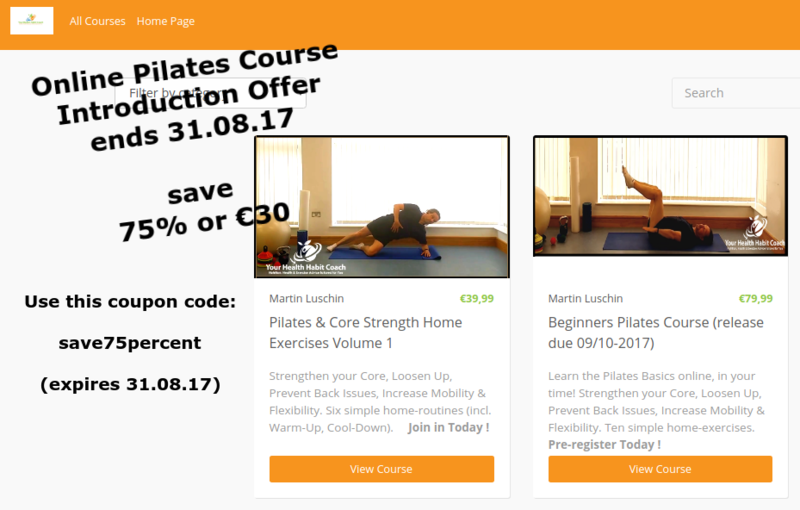 Did you ever wanted to do your Pilates routine and exercises at your pace, in your time – when it suits you – with detailed video instructions, a 4 week Programme & various pdfs ? Here is your chance. Use this coupon code “save75percent” before the 31st August 2017 and save 75% or €30 (the normal price is €39.99). All I’m looking for in exchange is that you fill out a short 3-4 questionnaire after two weeks. Head over to my partner fitness and Pilates site courses.yourhealthhabitcoach.com to check it out. You can even watch a few videos for free, after signing-up via the “Free Trial” option. This entry was posted in Deals Special Offers, Men Only Pilates, Morning Pilates Classes, Online Pilates, Pilates Videos, Pilates with Martin, Videos and tagged Home Pilates, Online Courses, Online Pilates, Pilates Core Strength Online, Pilates Exercises, Pilates Videos on August 21, 2017 by adminx. A quick note to let you know that I’m restarting my 2017 Pilates, Exercises and Fitness Classes during the week of Monday 9th January 2017. You might also check out the information about a *new* Nutrition & Health Coaching course that I’m starting on the 20th January 2017, see timetable I plan to update the rest of the website with exact details in the next three to four dates. This entry was posted in in Dublin, Men Only Pilates, Morning Pilates Classes, Nutrition Advice, Over 60s Pilaters, Pilates Classes in South Dublin, Pilates Exercise Program, Pilates with Martin and tagged close to Goatstown, close to Marlay Park, close to the LUAS, Leopardstown, Mount Merrion Community Centre, Pilates in Sandyford, Pilates in South Dublin, Pilates with Martin, Rathfarnham Court House, Taney Parish Centre on December 23, 2016 by adminx. In Video No. 12 you are going to learn various Neck, Back and Shoulder Stretches that you can do anywhere. Most of the stretches are done standing, some a done seated in a office chair. I recorded the video for a 10min Corporate – Lunchtime Class Sample, as I’m teaching a regular Mini-Stretching & Loosening Class in one of the corporate offices in Sandyford Industrial Estate. Class participants come along in their work / office suits, there is no need to change. Find a full description of this video and more details on my partner website www.yourehealthhabitcoach.ie/com. Let me know how you get on trying the exercises and e-mail me any question you might have. This entry was posted in Men Only Pilates, Morning Pilates Classes, Other Fitness Classes, Over 60s Pilaters, Pilates Classes in South Dublin, Pilates Exercise Program, Pilates Videos, Pilates with Martin, Posture Exercises, Videos and tagged Back Stretches, Desk Back Shoulder Loosening Program, in South Dublin, Loosening Exercise Video, Martin Luschin, Neck Streches, Office Stretches, Stretching Video on October 20, 2016 by adminx. This is different than most other videos that I recorded up to now, it doesn’t focus on Pilates, Fitness and Exercise. I met David and Stephen Flynn, the Happy Pear bothers during a Ulster Bank – Health & Well-Being week a while back and got the chance to ask one of them a questions (I’m part-time manage Ulster-Banks corporate gym in Sandyford Industrial Estate, Central Park, Dublin 18). “Whom do you follow on the internet in relation to nutrition and health advice?”. Watch the video below for his answers. Find a list of all physicians / doctors and links to their web-pages or facebook pages on my partner website www.yourhealthhabitcoach.ie/com. This entry was posted in in Dublin, Nutrition Advice, Videos and tagged Advice, Central Park, Doctors to follow online, Dublin 18, Happy Pear Brothers, Happy Pear Twins, Martin Luschin, Nutrition Tips, Physicians to follow online, Sandyford Industrial Estate, Ulster Bank Gym on October 10, 2016 by adminx. My 10th Pilates & Core Strength Video is out 🙂 See all videos below, some of them focus more on posture, others are a combination of back strength exercises or a mix of abdominal strength, back strength and back mobility etc.. Here a link to a list of all Pilates videos with detailed descriptions of the Pilates & Core Strength Exercises and Movements. in the future I will also include some of my www.YourHealthHabitCoach.com nutirtion and exercise videos on this website, these videos will focus more on Nutrition, Food, Diet and general Fitness, Toning & Health related topics and not only on Pilates & Core Strength. This entry was posted in Core Strength, Men Only Pilates, Pilates Videos, Videos and tagged close to Bellarmine, close to Central Park, close to Stepaside, Core Strength Videos, Dublin 18, in Dundrum, in Leopadstown#, in Rathfarnham, in Sandyford, Pilates in South Dublin, Pilates Videos, Sample Videos on September 18, 2016 by adminx. (1) Strengthen your global abdominal muscles, (2) challenge your waist (exercise no. 2) and lower abdomen (exercise no. 3), (3) focus a bit more on shoulder stability and shoulder placement. Keep your core muscles, your TVA (Transverse Abdominis) slightly engaged throughout to keep these exercises safe for your lower back. Always consult a GP / physician before starting a new exercises regime, especially if you haven’t exercised for a long time on a regular basis. Place your hands shoulder distance apart on the foam roller, your palms are below your shoulders. On a breath out straighten one after the other leg, your feet are hip-distance apart. Maintain a straight line from the top of your head, down to your ankles. Avoid dropping your hip, as this would most likely lead to an over arched lower back / lumbar spine, which would place unnecessary pressure on your lower back. Keep your shoulders relaxed, draw your shoulder blades down your back towards your bottom. Maintain a steady, continuous breath, avoid holding your breath. Hold for 8-10 breath cycles, keep your TVA (Trans Versus Abdominis), your core muscle engaged throughout. This is a “simple” variation of above mentioned Plank exercises. You start with the same set-up as above, but instead of holding the plank position you kick your straight leg from the hip to the side. Breath out as you kick your leg to the side, breath in as you switch sides. The rest of your body stays ideally completely still and stable, you just move from your hip joint. Keep alternating sides, legs until you have done a maximum of 10 kick to the right and left. Increase the number of repetition over time, allow your body to get used the exercise and challenge. This is another “simple” 😉 variation of above mentioned Plank exercises. You start with the same set-up as above, but instead of holding the plank position you draw you knee straight underneath your chest and upper-body. The movement is controlled, steady, slow – this will challenge your core muscles more. Breath out as you draw one knee or leg in, breath in as you switch sides. Increase the number of repetition gradually over time, allow your body to get used the exercise and challenge. ame as above, just crisscross your arms in front of your chest to intensify the movement..
Let me know how you get on and e-mail or facebook me your questions, comments or feedback. 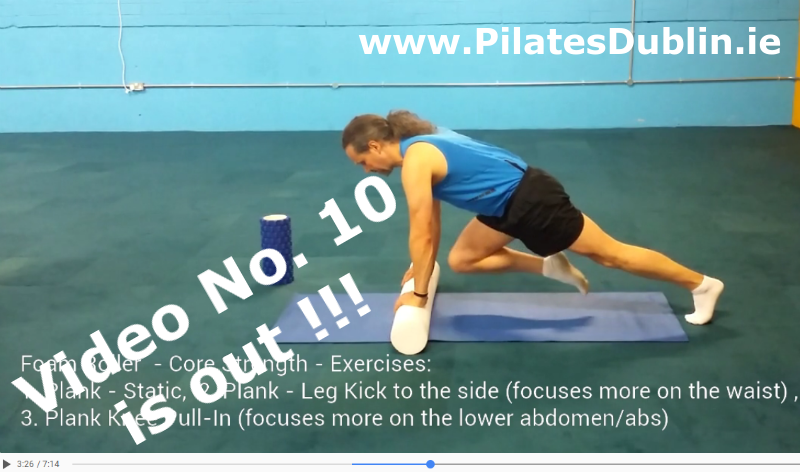 This entry was posted in Men Only Pilates, Pilates Classes in South Dublin, Pilates Videos, Pilates with Martin, Uncategorized, Videos and tagged Core Strength Exercises, Foam Roller, Foam Roller Exercises, in South Dublin, Plank Variations, Progression Foam Roller Core Strength Exercises, small bit Upper Body Strenth, Straight Arm Plank, with Martin on September 15, 2016 by adminx. (1) Stretch your Back and Spine out, (2) Mobilize and Loosen your shoulder area, (3) Stretch your chest out to prevent rounded shoulders. Keep your core muscles, your TVA (Transverse Abdominis) slightly engaged throughout to make these exercises safer for your lower back. Always consult a GP / physician before starting a new exercises regime, especially if you haven’t exercised for a long time on a regular basis. Lie flat on your foam roller, your feet are flat on the ground, your knees are bend. Make sure your mid and lower back stay reasonable close to the foam roller. Avoid overarching your lower back, lumbar spine, as this would put pressure on your back. Ensure that the back of your head is well supported, avoid dropping the head over the edge of the roller, as this would overstretch your neck. Then simply sway one to two inches from side to side, to massage your mid back and either side of the spine. Most class participants find this exercise very relaxing. This will also help you to prevent rounded shoulders, bad posture, as your pectoral muscles, your chest gets stretched out as well. Hold for around 10 long, deep breaths and aim to lengthen further away each time you exhale. Another simple exercise to loosen and mobilize your shoulder area and improve your posture. Start in the same position as in exercise number one. Reach with your fingers towards the ceiling, let your palms face towards each other, straighten your arms nearly completely, keep your neck long and relaxed. Draw your shoulders down your back, away from your earlobes. Breath in as you aim to lift / round your shoulder as much as possible off or away from the foam roller towards the ceiling, stretch your fingers as high as possible up towards the ceiling, while keeping the back of your head on the foam-roller. Breath out as you draw your shoulders back toward the ground, it is a bit like wrapping your shoulder blades around the foam roller, aim to keep your arms straight as you do this. Breath in as you restart. Repeat 10 times. Same as above, just crisscross your arms in front of your chest to intensify the movement.. This entry was posted in Pilates Videos, Pilates with Martin, Posture Exercises, Videos and tagged Belarmine, Churchtown, Foam Roller Exercises, Lambs Cross, Leopardstown, Mens Pilates, Pilates for Men, Pilates in Dundrum, Pilates in Rathfarnham, Pilates in Sandyford, Pilates in South Dublin, Pilates Videos, Pilates with Martin, Posture Exercises, Posture Improvement, Posture Video, Sandyford Hall, The Gallops, Willbrook on August 20, 2016 by adminx. In this Pilates Video you are going to learn three Pilates Exercise that increase Core Strength, Back Mobility and Back Strength. (1) Pilates Single Leg Stretches, (2) Roll Like a Ball or Roll Back, (3) Pilates Shoulder Bridge. More details to follow …over the weekend. More details to follow … over the weekend. This exercise might not be for your if you have any back issues. This entry was posted in Men Only Pilates, Morning Pilates Classes, Over 60s Pilaters, Pilates Videos, Pilates with Martin, Videos and tagged Pilates Dundrum, Pilates in Sandyford Community Centre, Pilates in South Dublin, Pilates Leopardstown, Pilates Rathfarnahm, Pilates Roll Back, Pilates Rolling like a ball, Pilates shoulder bridge, Pilates Single Leg Stretch, Pilates Videos on August 13, 2016 by adminx. In this Pilates Video you are going to learn three variations of an Pilates Exercise called the Roll-Up. The exercise focuses on your straight abdominal muscles / your rectus abdominis and a small bit on lower and mid back mobility. Sit with your legs straight stretched out in front of you and aim to straighten your back as much as possible, keep your shoulders and neck relaxed. Breath in to prepare, breath out as you tuck your tailbone under, draw your chin slightly in towards your chest and gradually easy vertebrae by vertebrae onto the mat. Aim for a slow and controlled movement, avoid any rushed or jerky moves to keep it safe for your back. Breath in as you reach cross over your body to lengthen your back and spine. Roll your back in the same controlled way off the mat as you breath out and reach away to your feet to incorporate a hamstring / back of your leg stretch. Repeat up to ten times. This exercise might not be for your if you have any back issues. Same as above, crisscross your arms in front of your chest to intensify the movement. Still stretch your whole body out as your hands and fingers reach away for a moment. Same as above, stretch your arms / fingers away towards the ceiling, your palms are facing towards each other. This intensives the movement further and requires more control. This entry was posted in Men Only Pilates, Morning Pilates Classes, Pilates Videos, Pilates with Martin, Videos and tagged Dublin 14, Dublin 16, Dublin 18, in Rathfarnham, in South Dublin, Pilates Dublin, Pilates Roll-Up, Pilates Video with Martin, Pilates Videos, Roll-Up, Sandyford, Sandyford Industrial Estate, with Martin on July 28, 2016 by adminx. In this Pilates Video you are going to learn three exercises, two Pilates, Core Strength Exercises and one Upper-Body Toning and Strengthening Exercise. (1) Pilates Push-Up & Roll-Down >> Focuses on increasing upper-body strength (arms, chest), improves spin & back mobility a small bit. Stand tall, arms, shoulders and the neck area are relaxed. Roll-down into a push-up position, place your hands wide, to the right & left of the mat, aim to keep you neck long, avoid dropping your head if possible to avoid tension in the neck. Keep your hip lifted, maintain ideally a straight line – ankles, knees, hips, shoulders, top of your head. Breath in as you lower your upper-body, breath out as you push away from the mat or floor. Roll up on the next breath out and come into a standing position. Kneel in front of the ball, your wrists rest on ball, your elbows are slightly bent. Maintain a straight line from your knees to your shoulders and the top of your head. Keep your shoulders and neck loose and relaxed. Breath out as you roll out, breath in as you roll back up. Avoid dropping your hip and keep your TVA, core muscles slightly engaged to protect your lower back. (3) Russian Twist with a Gym / Swiss-Ball >> Focuses on toning your waist / increasing oblique strength and gets your thighs, buttock / gluteal muscles and mid / lower back a bit as well. Rest the top of your upper back and the back of your head on a gym-ball, lift your hip to create a straight line from your knees to the crown of your head, keep your hip lifted and your ankles below your knees. Reach with your arms towards the ceiling, palms facing inwards. keep the shoulder relaxed. Breath out as you turn from your waist to the right, remember to keep you hip lifted, breath in as your return to the centre, turn to the left on your next out breath, breath in returning to the centre. (1) Do a brief warm-up of 5-8min including some rotational and loosening moves for your neck, back, shoulders and your lower back or do some cardio exercises for 5-8min e.g. brisk walking. (2) Do each exercise up to 10 times, assuming your back, neck, shoulders, knees and other joints etc. agree with the movement and there is no pain. Do three sets of each exercise. (3) I suggest to keep an exercise and activity diary, which will allow you to recognize progress. (3.3) how the exercises are getting easier over time. I came up with a rating system. I use a scale from 1 to 10 ( 1 = very very easy; 10 = extremely hard, nearly impossible). This entry was posted in Men Only Pilates, Morning Pilates Classes, Pilates Classes in South Dublin, Pilates Videos, Pilates with Martin, Videos and tagged Ball Roll Out, Core Strength Exercises, Dublin 14, Dublin 16, Dublin 18, Dundrum, Leopardstown, Pilates for Men, Pilates Push-Up, Pilates Roll Down, Pilates South Dublin, Pilates Video with Martin, Pilates Videos South Dublin, Rathfarnham, Russian Twist, Sandyford, Sandyford Industrial Estate on July 24, 2016 by adminx.